Pelvic floor physical therapy at our UCLA Medical Center Santa Monica location. These pelvic floor physical therapists are specially trained to treat incontinence. For patients who do not respond to more traditional treatments such as dietary changes, pelvic floor physical therapy, bladder retraining, and medical therapy, UCLA offers the latest, most technologically advanced therapies available anywhere. 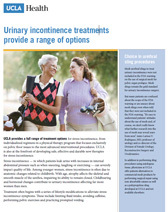 UCLA Urology has expertise in several highly effective outpatient or office-based procedures to treat urge incontinence, including sacral neuromodulation and injection of Botox into the bladder.